Washing your windows takes you a too much time and efforts? You can do something different now – simply get in touch with our representatives and book our window cleaning in Kentish Town. We will manage this nuisance for you and the outcome will be appropriate for all parts of your windows – glass surfaces, framework and sills. With our help, you will have the flexibility to do whatever you desire with the time you usually spend for window cleaning. But our services will bring you even more, as you can see from our list of benefits. We also provide our professional services in nearby areas: Gospel Oak, Camden Town, Chalk Farm, Tufnell Park, Belsize Park. We use the most progressive techniques to ensure you take advantage of highest quality window cleaning. With our water-fed extension pole cleaning system and high pressure cleaning methods, you will enjoy perfectly clear look of your glass surfaces. We attach our poles to water supply devices in our vehicles to make sure that there is no danger for the exterior of your home or business premise. For higher windows, we employ entirely secured rope access approach. You can benefit from these cleaning methods now – just dial 020 3746 3113! With our know-how and technical proficiency, you can depend on us for domestic and commercial window cleaning. Your home will look amazing after the service, no matter what kind of windows you have. We clean small, double or sash windows, French doors, patio doors and bay windows. Moreover, we clean skylights, garden windows and conservatories. In other words, you can count on us for thorough cleaning of your windows, including the framework and ledges. You will appreciate the perfectly looking office with the help of the specialists of commercial window cleaning. You can depend on our first-rate services for every kind of business premises. For example, if you have a small shop, we can thoroughly wash its windows by using our water fed extension pole system – it gives us the chance to reach up to the fourth floor. If you seek pristine look for the glass panes of a tall business property in London and the nearby areas, we will put in use our rope access gear. In any case, you will enjoy excellent results in no time. 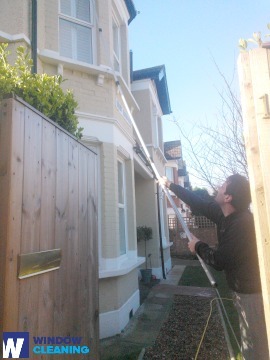 You will see your sparkly clean home after the professional window cleaners in Kentish Town visit you. We deliver the best services for the entire London district. The most advanced techniques are included in our working practice – including water-fed extension pole system and and hard pressure cleaning. You will see for sure the change domestic hygiene – we use purified water for the process of inside and out window washing. Give us a call today on 020 3746 3113. Our customer agents will help you and answer your questions. Or you can use our on-site booking from.